Everybody, how you doing today? 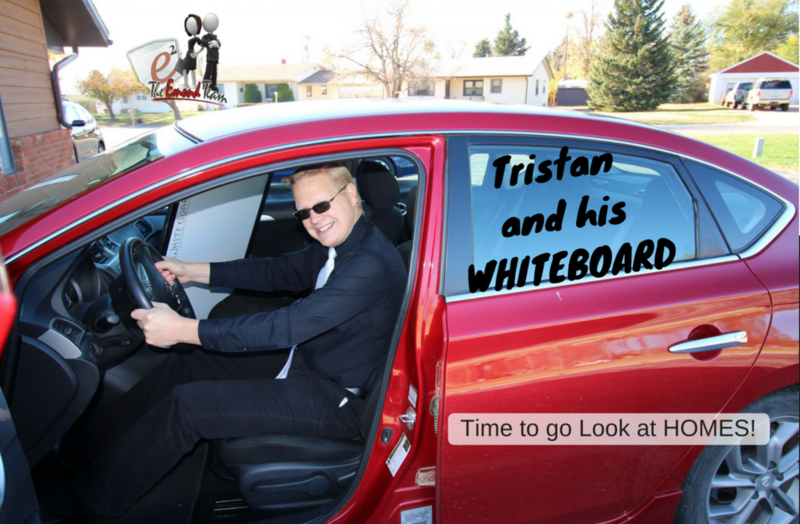 Tristan Emond with Mindful Living Realty with Tristan and his WHITEBOARD – LIVE! So today we’re going to talk about another “Please DO” scenario, mostly for buyers, but also the sellers understand what’s going on. We’re talking about the importance of the paperwork in the real estate transaction. Now of course, when I say paperwork – that’s a little “loosely” used…loose leaf paper…”loosely”…did you get that? Anyway, we use lots of digital signatures, so it’s technically not “paper”work. But we’re talking about the documents at play. However, first we need to have our joke for the day. What you call a group of singing dinosaurs? A Tyranno – chorus. Tyranno-chorus. Why is Paperwork so Dang Important? What about the marketing of my property? How can you help me buy a home? And that’s all well and good, but that’s just a small part of the process. The paperwork piece of it can be very, very crucial and vital to the success of the transaction. So first of all, what’s one reason why it’s important? Legal Aspects. The paperwork you have on your transaction is your last line of defense for anything that might happen in the transaction. Whether you’re talking about the ending of time frame for an inspection contingency or the closing date. Or if something goes wrong at the end and you’ve got a buyer/seller dispute. The paperwork is what the judge or the law should look at it and say “Hey – this is what you signed. This is what the paperwork says. I don’t care what you said over here, what you said over there necessarily. But this is what you signed.” So it’s very important to make sure that the paperwork’s in place and everything is done appropriately and properly. Sellers as well – your disclosures are the most important paperwork for your protection for you to make sure that it’s all written out correctly and everything is disclosed. Because if something is found out – the buyer finds out that you hid something, they’re going to come after you. If you got it all disclosed, you’re legally free. Say, “I took care of that. I told you about that.” Right? Very, very important on the legal aspect of the paperwork process. Number two: it is required. There is not a deal until it is written down and signed per South Dakota law. Especially if it’s a lender transaction…if we’re dealing with a FHA, VA, RD (rural development), government backed loans. They’ve all got all the rules and regulations in place where they have to have certain paperwork in line. You’re going to have a whole heap of things that the lender needs from you. The documentation of income. The rent history. Your employment verification. Explanations to prove your assets, to prove what you’re doing. A lot of it might be… about where the money went in taxes here, there, or the other. It might seem like is very intrusive. It’s like “Hey, what do you need all this information for?” They have their procedures, they’ve got their processes. It’s all must be done according to the rules are in place. You need to make sure that you’re there getting that paperwork into your lender as soon as possible. Now you might say I don’t wanna do that… No comply, no loan. Kinda simple as that. The lender in this scenario is the boss. Whatever they say – jump. Or you might think “Well, maybe try different lender.” If you need the same type of loan – a government type loan especially – it’s probably not going to be a whole lot different anywhere else. However, your conventional loans are a whole lot easier on the paperwork. They have less government red tape basically in the back of it. But you’ll still have to comply to all those paperwork requirements that the lender might need. Seller – understand the buyer has to go through these processes. And you might have to sign a few extra pieces of paper because the lender needs it. Now you might say you don’t want to sign all that paperwork, but the lender needs it to close the home so…. You either sign the document or don’t sell your home. The lender kinda rules the world when a buyer has the need to purchase the home with a home loan. Number three and probably the most important one: Speed. When in the transaction, do you have the most frustration, the most problems when something falls through? Typically speaking it’s not the negotiation. It’s not the inspections. It’s at closing – when closing has to be extended. You’ve got everything lined up for people coming, the seller’s trying to move out…All these pieces are trying to come together at the end. And if that bangs up at the end, that causes a whole whirlwind of fun. It is very important to make sure that you get your paperwork in as soon as possible. If you’re the one holding up the show, that’s not going to be good for you and your seller or whatever you are. Be sure to get your paperwork into the lender as soon as possible to make sure we can close as soon as possible. They’ve (the lender) got their procedures. They’ve got to get the paperwork in. They’ve got to approve it. They got their review scenarios. And they’ve got timelines that they must work in. Getting paperwork in to them at the last minute is not going to be a vital component for success for getting your home closed as soon as possible. Go through all the pieces of paper that you have – go through all your paperwork. If there’s a – something that’s not marked, or something’s not checked, make sure that you ask your agent about that and say, “Hey should this be marked, should this be checked?” And then of course, and make sure that you ask your agent, say “Hey, is everything filled out correctly? Are we good?” Everything needs to be done correctly. I got my wife, Sarah, over here. She makes sure that everything is done very well. She will tell me quickly if I have problems…which I usually do, you know, but she’s there to make sure that everything’s filled out correctly. Make sure everything is in place for you guys. Talk later, see you next time, on Tristan and his WHITEBOARD.